Time to Overcome That Clogged Pipe - Johnson Heating & Cooling Inc.
One of the more common reasons why a homeowner may contact a plumber for assistance is due to a clogged drain or pipe. Some homeowners will attempt to remove a clog on their own, but the fact is that most clogs will develop deep in a pipe and will require professional assistance to remove. Even when a clog is reachable, there may be benefits associated with using professional plumbing assistance. Plumbers typically will use hydrojetting to clean your pipes. After you have learned more about what this process is, you will be ready to schedule your appointment with a plumber. 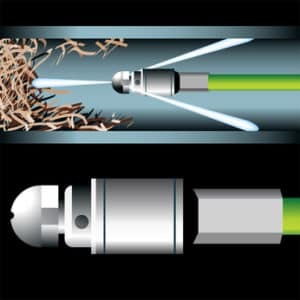 Hydrojetting is a method of pipe cleaning that plumbers commonly use. It can be used to remove partial or full clogs anywhere in the pipe. It also can be used to clean pipes even when no clogs are present. After all, even if the pipes appear to be functioning well, there may still be debris lining the inside of the pipes that is building up. This could eventually create a clog, but hydrojetting can remove the debris before it becomes problematic. If you are not familiar with hydrojetting, you may be wondering how this service is completed. The plumber will utilize a powerful machine that will emit a forceful stream of pressurized water through the pipes. The speed of the water as it rushes through the pipes will remove any matter that is located in the pipes. This gives the result of power washing your pipes. The most obvious benefit associated with hydrojetting is that your clogs will be removed and your pipes will be thoroughly cleaned. Any issues with drainage that you were having will be eliminated. In addition, when compared to the use of chemical cleansers, this is an environmentally friendly solution. It also has the ability to clean the entire pipe, whereas a snake device may only remove clogs that are located within a few feet of the drain. Other benefits include giving a fast resolution to your challenge and being affordable. Clogged drains and pipes can be annoying and inconvenient, and in some cases, that can interfere with your ability to use your plumbing features. If you need to learn more about hydrojetting or if you are ready to set up an appointment to have your pipes professionally cleaned, now is the ideal time to contact a plumber for assistance. If you suspect build-up in your lines, don't hesitate to schedule hydrojetting services. Call (317) 881-7738 and let Johnson Heating & Cooling clear the pipes of your Greenwood home.